වෙනත් භාවිතා සඳහා, සිංහයන්ගේ දොරටුව (වක්‍රෝක්තිහරණය) බලන්න. සිංහ දොරටුව යනු දකුණුදිග ග්‍රීසියේ ලෝකඩ යුගයට අයත් මයිසීනී බලකොටු නගරය වෙත යාම සඳහා වූ ප්‍රධාන පිවිසුමයි. ක්‍රි.පූ. 13වන සියවසේ දී ඇක්‍රොපොලිසයේ වයඹදිග පෙදෙසේ ඉදිවූ මෙයට මෙම නම ලැබී ඇත්තේ එහි පිවිසුමට ඉහළින් ඇති පෙරමඟ දක්වන විලසින් සිටින සිංහධේනු හෝ සිංහ රූ ද්විත්වය සහිත කැටයම නිසාවෙනි. මයිසීනියානු ප්‍රතිමා කලාවේ නිරුපද්‍රිතව ඇති එකම ස්මාරක කෘතිය වන අතර, ප්‍රාග්ඓතිහාසික ඊජියානු විශාලතම ප්‍රතිමාව ද වේ. එසේම ග්‍රීක ලෝකඩ යුගයට අයත් ප්‍රතිමාවිද්‍යාත්මක මෝස්තරයක් දරන භූගත නොවූ එකම ස්මාරකය ද මෙයයි. එසේම පුරාතන සම්භාව්‍ය සාහිත්‍යයේ විස්තර වන එකම කැටයම ද මෙයයි. මේ නිසා ඒ අනුව මෙය නූතන පුරාවිද්‍යාවටත් පෙර සිටම ඉතා ප්‍රචලිතව පැවති බැව් පෙනේ. නූතන සාහිත්‍යය තුළ සිංහ දොරටුවේ පළමු නිරවද්‍ය හඳනාගැනීම සිදුවූයේ ෆැන්චෙස්කෝ ග්‍රිමානි විසින් සිදුකරන ලද සමීක්ෂණයක දී ය. මෙය 1700දී මොරියා රාජධානියේ ප්‍රෝවෙඩිටෝර් ජෙනෙරාල්ගේ නියමය අනුව සිදු විය. ඔහු මයිසීනිහි නටබුන් හඳුනාගැනීමට සිංහ දොරටුව පිළිබඳ පෝසානියස්ගේ විස්තර උපයෝගී කොටගත්තේ ය. ↑ Gates 2003, pp. 136–137. ↑ Hampe & Simon 1981, p. 49: "The lions, who looked out over the land, served to protect the gate and the city. They also show that the city, and the king who ruled it, stood under the protection of the goddess Hera. The Lion relief is the sole monumental piece of Mycenaean sculpture which has come down to us." ↑ Blakolmer 2010, p. 49. ↑ Beaudouin 1880, pp. 206-210. ↑ Pausanias. Description of Greece, 2.16.5. ↑ Moore, Rowlands & Karadimas 2014, p. 4: "The first modern, correct, identification of Mycenae seems to have been made in 1700, when the government of Venice ordered Francesco Grimani, Proveditor General of the Armies in Morea, to register all their properties in the Peloponnese. The record was completed under the direction of the engineer, Francesco Vandeyk, who not only made detailed plans for each village, but also studied and described ancient monuments. Among them was the ancient site of Mycenae which he was able to identify on the basis of Pausanias' description. Vandeyk reported a monumental entrance where a triangular relief was sculpted with two lions disposed heraldically against a column. He noted that these lions stepped their forepaws on two altars and, as a result, the entrance is known today as the Lion Gate. Indeed, Pausanias' own description of the Lion Gate was so accurate that it did not leave any doubt that the monumental acropolis, close to the modem village of Charvati, was the site identified by the ancient author as Agamemnon's citadel." Blakolmer, Fritz (2010). "Images and Perceptions of the Lion Gate Relief at Mycenae during the 19th Century". මෙම කෘතිය තුල: F. Buscemi. The Representation of Ancient Architecture in the XIXth Century. Cogitata. පිටු 49–66. http://www.academia.edu/12812593/. Castleden, Rodney (2005). Mycenaeans. London, United Kingdom: Routledge. ISBN 978-0-415-24923-2. https://books.google.com/books?id=7497bECxXpMC. Gates, Charles (2003). Ancient Cities: The Archaeology of Urban Life in the Ancient Near East and Egypt, Greece, and Rome. New York, New York: Routledge. ISBN 0-415-12182-5. https://books.google.com/books?id=8aLb5pnm1j4C. Hampe, Roland; Simon, Erika (1981). The Birth of Greek Art: From the Mycenaean to the Archaic Period. New York: Oxford University Press. https://books.google.com/books?id=YrLpAAAAMAAJ. Iakovidis, Spyros E. (1983). Late Helladic Citadels on Mainland Greece. Leiden, The Netherlands: E. J. Brill. ISBN 90-04-06571-7. https://books.google.com/books?id=HC8z45SrmQ0C. Kleiner, Fred S. (2009). Gardner's Art Through the Ages: A Global History. Cengage Learning Incorporated. ISBN 0-495-11549-5. https://books.google.com/books?id=7hHoNnapt70C. Mylonas, George Emmanuel (1957). Ancient Mycenae: The Capital City of Agamemnon. Princeton, NJ: Princeton University Press. https://books.google.com/books?id=7XsJAQAAIAAJ. Mylonas, George Emmanuel (1966). 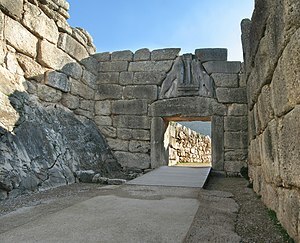 Mycenae and the Mycenaean Age. Princeton, NJ: Princeton University Press. https://books.google.com/books?id=wozpAAAAMAAJ. O'Brien, Joan V. (1993). The Transformation of Hera: A Study of Ritual, Hero, and the Goddess in the Iliad. Lanham, Maryland: Rowman & Littlefield Publishers, Incorporated. ISBN 978-0-8476-7808-2. https://books.google.com/books?id=a77yKM26GfYC. Younger, John G. (1978). "The Mycenae-Vapheio Lion Group". American Journal of Archaeology. Archaeological Institute of America. 82 (3): 285–299. JSTOR 504459. Aström, P.; Blomé, B. (1964). "A Reconstruction of the Lion Gate Relief at Mycenae". Opuscula Atheniensia (OpAth). 5: 159–191. Blackwell, Nicholas G. (July 2014). "Making the Lion Gate Relief at Mycenae: Tool Marks and Foreign Influence". American Journal of Archaeology. Archaeological Institute of America. 118 (3): 451–488. doi:10.3764/aja.118.3.0451. මේ පිටුව අන්තිමට සැකසුවේ 4 ඔක්තෝබර් 2017 දින දී, 04:20 වේලාවෙහිදීය.